Designer, speaker & side project addict. Thoughts? Tweet them to me! When I was new to earning money online, I stumbled across income reports posted by people like Pat Flynn, Abby Lawson and Nathan Barry. I felt like I'd struck gold. I could look at what different sources of income they had to get ideas for new areas to explore, and I could get real insights into how they were structuring their businesses. Now that I've been running my own little business for over a year I've decided to start posting income reports too, so that I can pay it forward. Now, my business is different to Pat's, Abby's and Nathan's in one major way: I still work full time hours for a company as a marketing designer (Nathan's company in fact!). On the side though, I've got several other income sources so I thought it would be interesting to show you what those sources are and how the earnings from my main job compare to my side hustles (namely a YouTube channel and a podcast). That said, I think you'll get a lot of value in seeing my income breakdown (or at least just find it interesting), so let's get into it. In the 2017/18 tax year, 83% of my total income came from my job at ConvertKit. That means I earned 17% of my income from side hustles. I was fairly surprised by that number to be honest! I thought it would be lower as income from side hustles hasn't been something I've truly focussed on yet. Figuring out this percentage gives me a baseline to try increase next year. I've grouped my earnings into what type of work they involved: design, content creation, community and physical products. Design dominates when we look at my total income of course (probably what you'd expect for a designer! 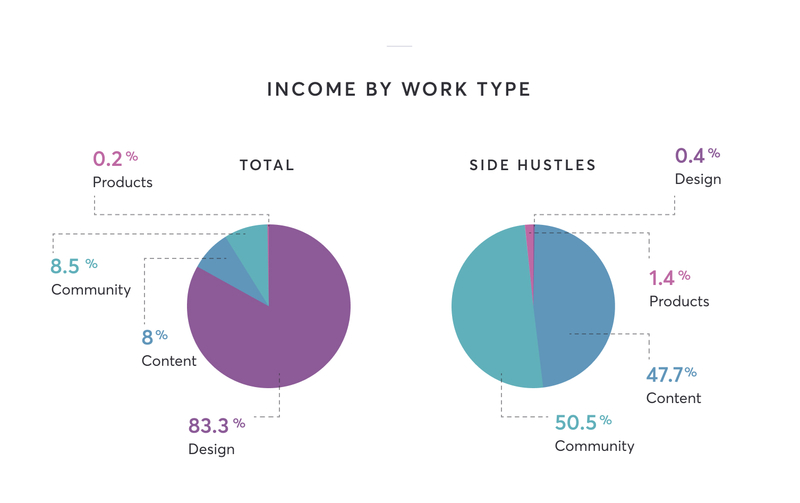 ), but looking at just the side hustles: design makes up the smallest portion. I used to do more freelance design work, but I only took on one very small job last year. I was surprised to see community taking the lead in my side hustle income categories, mainly because it was something brand new I started last year. I was getting paid for content creation much earlier in my YouTube 'career' and have been selling physical products since I was in university, but 2017 was the first time I tried out running online communities. My income sources for this category were a private monthly membership design community my co-host Femke and I created for our podcast audience in November 2017, and a Patreon I started in October 2017. I was overwhelmed by the support when I launched my Patreon! I had no idea how many people were ready and willing to become a member, and I'm going to write a post in future about how I ran a launch special in the first 24 hours. The largest chunk of the content creation category is sponsorships. This is where a brand gives you a brief and you create content (usually a video or a blog post) to get their message across to your audience. This slice could be a LOT bigger if I were to take on all of the opportunities that come my way for sponsorship, but I am extremely picky about what brands I'll work with and promote to my audience. I've worked hard to build a reputation and an audience who trusts me, and I would never want to take advantage of that just to earn a quick buck. I'm really really proud of the four main brands I worked with in the last year: Transferwise, Squarespace, Webflow and Visit Scotland. 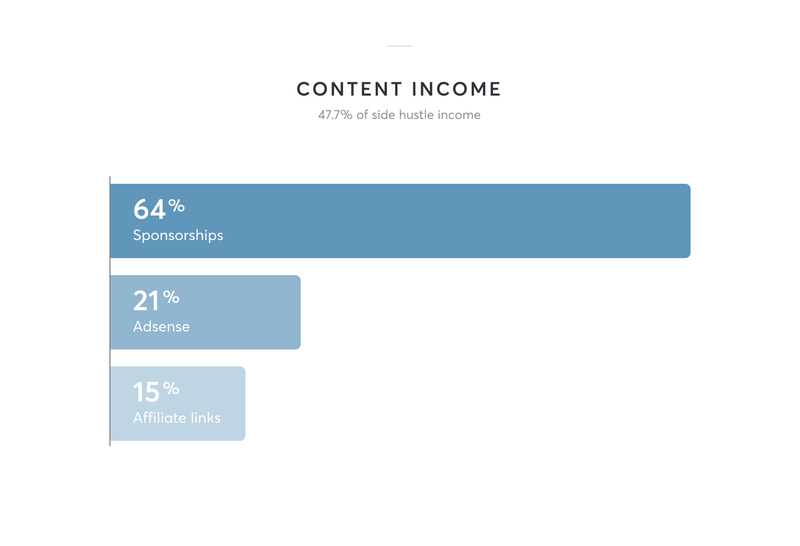 Smaller pieces in this content category are Adsense earnings and affiliate income. A few years ago I stopped putting pre-roll ads on my YouTube videos because I didn't like that I couldn't choose which companies were subconsciously associated with my content. So the little slice you see here is residual earnings from views on older videos before I made this decision. Affiliate income is something I want to work on growing next year. Just like with sponsorships, I would never want to betray the trust of my audience by being an affiliate for a product I didn't know for sure they'd get value from, so there are currently just three main sources within my affiliate income: Treehouse (the online code school I found incredibly valuable when learning to code), Webflow (the visual website builder I created this site with) and Amazon (for linking to products I've bought and liked). I'm excited to report back on what affiliate programs I'm joining this year to add to this sub-category. Lastly, the smallest chunk of my income pie: physical products. I won't lie it makes me a little sad to see how tiny this slice is because, in case you didn't know, I started a t-shirt company about 9 years ago. At one stage it was my dream to grow that brand and turn it into a full time thing, but since I started making YouTube videos I found myself feeling less and less interested in all the details and work it takes to produce, sell and ship physical products (t-shirts in particular!). As someone who loves beautiful physical products I do still want to make and sell them, but I'm definitely not aiming to make it a focus. Physical products will be my creative outlet; not something I'm expecting will earn me a lot of income. 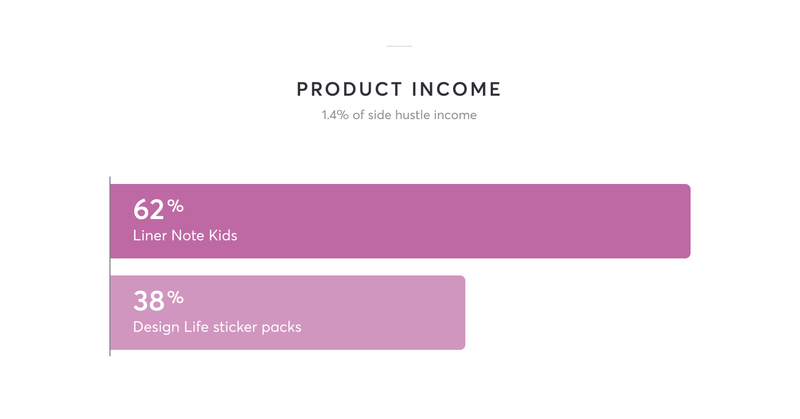 This year 62% of my physical product income was from my soon-to-be-closed brand, Liner Note Kids (tshirts and prints) and 38% was from my share of the sticker packs we sold to support our podcast, Design Life. Next year there's a new category I want to add to my income: digital products. I'm interested in more low-touch ways of earning income (hence my goal to increase affiliate earnings too), and digital products are a heck of a lot easier to deliver to a customer than something physical. I've got several ideas I'm really excited to work on, so stay tuned for 2018's income report to see how they pan out! I hope you enjoyed reading about my different income sources. If there's something in particular you'd like me to dive deeper on, hit me up on Twitter and let me know! Now that I've got this brand new blog up and running I'm looking forward to sharing more business-focussed topics alongside my regular design content. Got any thoughts on what I wrote? Tweet them to me! Stick around, there’s more where that came from. In 2008, I accidentally started a business. This is the story of my first side project, Liner Note Kids. Reflecting on the year that's been and looking at what I'll change in the year ahead.